The Northern Irish party which props up Prime Minister Theresa May's government said on Friday the UK PM has betrayed her Brexit vows. The party leader, Arlene Foster, accused Theresa May in her Friday tweet of doing exactly what the PM vowed not to do — allow a hard border between Northern Ireland and the Republic of Ireland post-Brexit. The social media post comes as the Democratic Unionist Party (DUP) party responded to May's letter addressed to Foster, which was leaked to the Times. 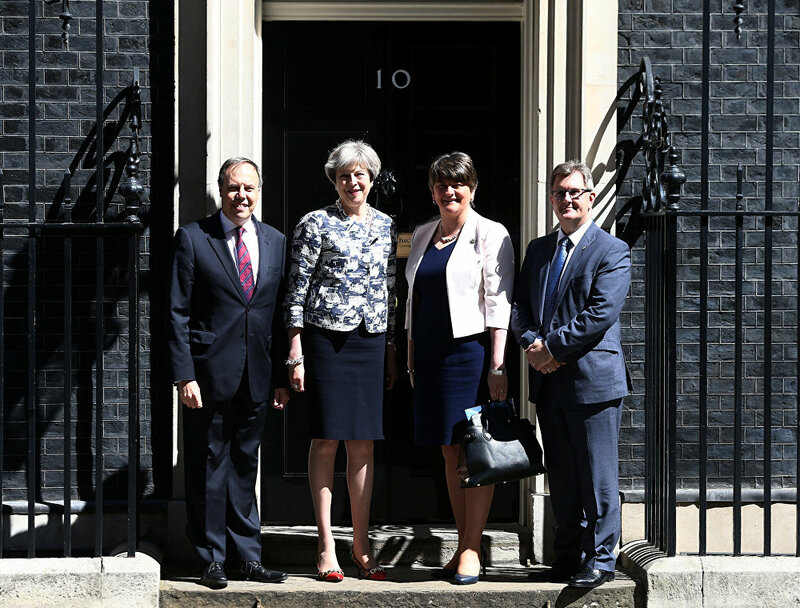 Britain's Prime Minister, Theresa May, poses for a photograph with Democratic Unionist Party (DUP) Leader Arlene Foster, Deputy Leader Nigel Dodds, and Chief Whip Jeffrey Donaldson, outside 10 Downing Street, in central London, Britain June 26, 2017. Foster claimed that the PM's letter raised "alarm bells for those who value the integrity" of the United Kingdom. In the letter, Theresa May said she would not allow an Irish border backstop that separated Northern Ireland from the rest of the UK to ever come into force. For the DUP however this meant that Westminster will agree to a Brexit deal that includes a backstop arrangement, something the party has opposed from the start. 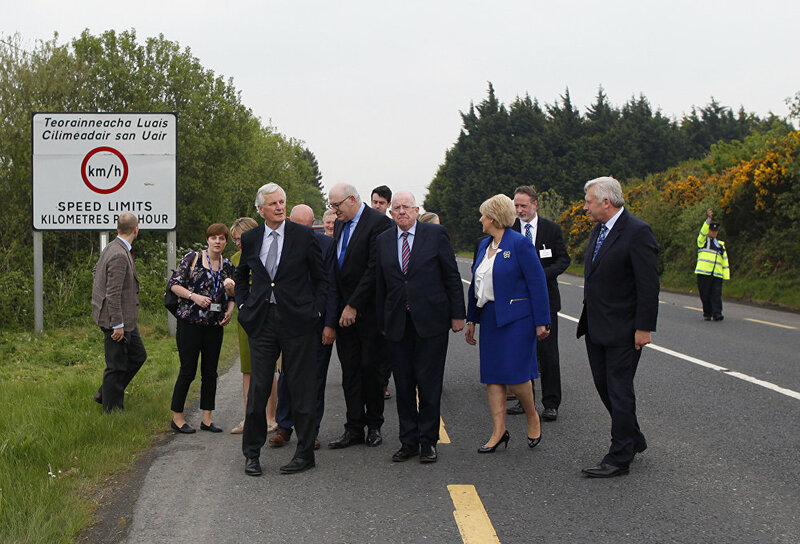 The European Union's chief negotiator Michel Barnier, front left, and Charles Flanagan, center, Minister for Foreign Affairs walk along the Irish border close to Castleblayney, Ireland, Friday, May 12, 2017. "From her letter, it appears the PM is wedded to the idea of a border down the Irish Sea with NI in the EU SM regulatory regime," Foster said in her post. The DUP are propping May's government in Westminster following the 2017 general election, when the Conservatives forged a coalition with the Northern Irish unionists to retain the majority in the parliament. But when it comes to Brexit, the DUP were determined to oppose any deal suggesting a divide between Belfast and the rest of Britain was a "red line" for the unionists. On Friday, the DUP called on the UK government to provide clarity on the ongoing Brexit negotiations. "Unlike the previous political declarations, the scope for delay, fudge or obscurantist language has passed. This is now a time for clarity and plain speaking," the DUP said in a Twitter post featuring the party letter to Theresa May dates November 1. The spokesman for the DUP, Sammy Wilson, confirmed that regulations cooked in Europe and then imposed on Belfast would result in Northern Ireland being cut off from the UK. Media reports and political rumours in Westminster and Brussels indicated that a Brexit deal breakthrough could have happened in November — a notion shrugged off by politicians in Dublin and London. Earlier this week, Irish Prime Minister Leo Varadkar, expressed doubt a special November summit would see a deal framework complete. He suggested the December EU summit was a more likely scenario to get the agreement ready. "…we do have one scheduled for the 13th, 14th of December, so not getting it done in November doesn't mean we can't get it done in the first two weeks of December. But I think beyond that you're into the New Year, which I think wouldn't be a good thing," the Irish PM warned. The Irish government is willing to consider a review clause attached to the backstop and agreed with Theresa May that such solution should be temporary. A "backstop" arrangement was proposed as part of the Britain's withdrawal deal from the EU. It would ensure an open border by keeping Northern Ireland inside the EU customs union and large parts of the single market. Britain has suggested a UK-wide backstop, with Britain remaining aligned with the EU customs union for a limited time after 2020.